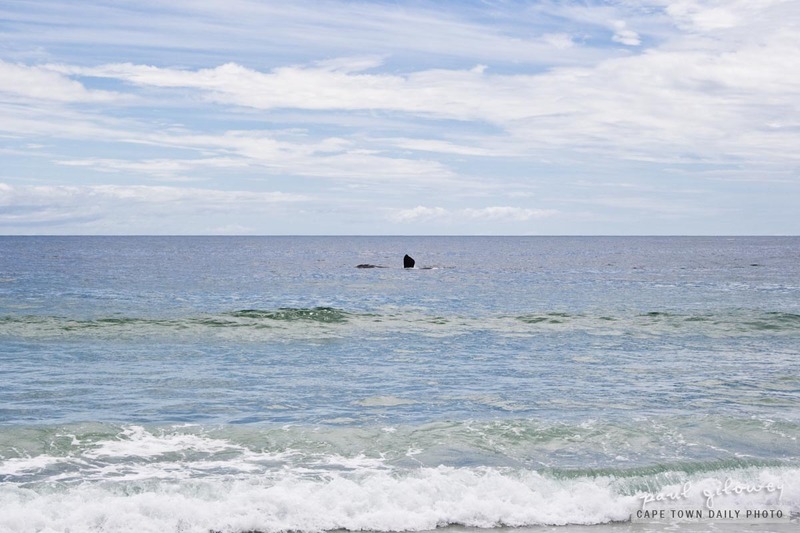 Besides for the calm ocean and the blue sky with it's pretty clouds, what you see, not too far from shore, is a whale relaxing just off Camps Bay beach. I've never seen a whale in off Camps Bay beach before - not that they don't enter the larger Table Bay area - but they're just more prolific on the False Bay side of the peninsula where the water's just that little bit warmer. I spent a long time watching this one roll about in the water until I finally got bored waiting for the perfect breach, or tail fin. 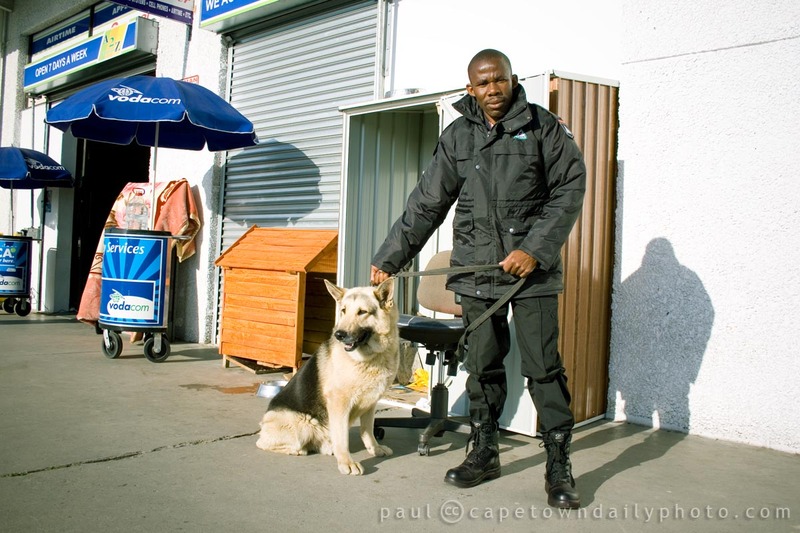 Posted in General and tagged animal, camps bay, sea on Sunday, 21 November, 2010 by Paul. Working as a security guard must be one of the most stressful jobs. On the one hand it's probably mostly metronomically monotonous, and on the other hand you never know when you're going to face off against a criminal that possibly has less than you to lose, and possibly less regard for your life than a Cinderella's step mother did for her's. Posted in General and tagged animal, people on Friday, 13 August, 2010 by Paul. Apparently the grass on Muppet's side of the fence wasn't quite tasty enough and lacked in iron so he started sucking on this bloudraad fence to get that great iron taste in the back of his mouth. Bloudraad, in case you don't know, literally translated from Afrikaans means blue wire and, as you may guess, got its name because of its blue hue. Afrikaaners have a saying "'n boer maak 'n plan" which basically means that boers (farmers) are extremely resourceful and - much like McGyver - are able to solve problems on their farm (normally with little more than a piece of bloudraad and a pair of pliers). 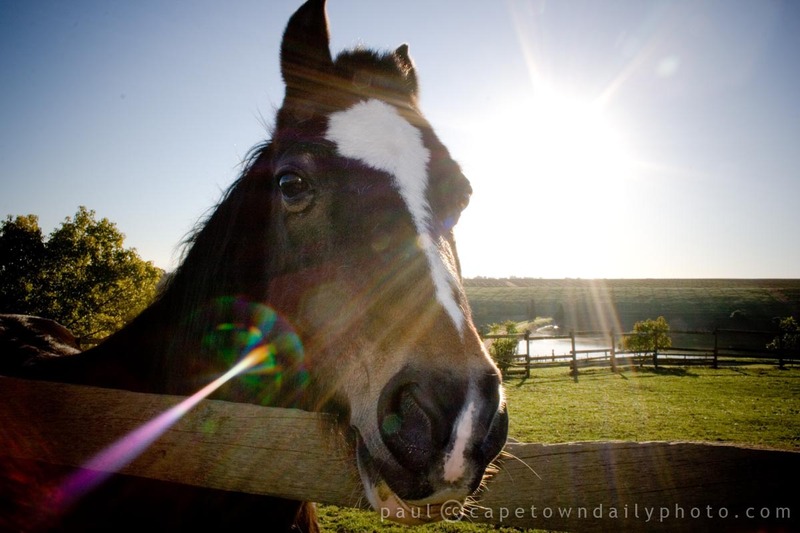 I took this photo of Muppet (not his real name) somewhere out the back of Durbanville. Posted in General and tagged animal on Thursday, 3 June, 2010 by Paul. Apart from the fact that it was a little cooler than expected, we had a fun day being driven around the park. Our eagle-eyed guide, Bongani from Viva Safaris, pointed out birds, zebra, elephant, giraffe, lions, buffalo, wildebeest, crocodile, waterbuck, kudu, rhino, and a few other animals - most of which we would never have spotted amongst the bushes had we driven ourselves! Bongani spent the entire day driving, spotting, and telling us stories about almost every animal that we stopped to take a look at, making the outing not only an awe-inspiring experience, but an informative learning experience as well. 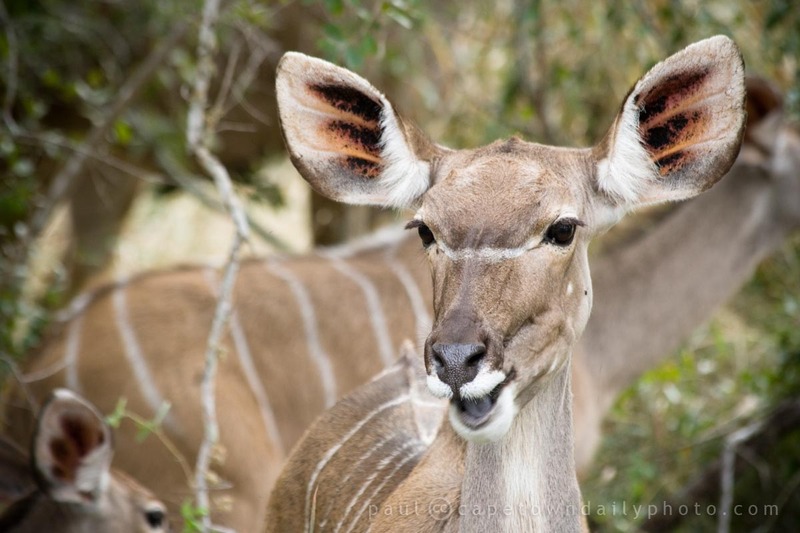 Besides for the kudu that I've used for today's photo I took plenty of photos over the course of the day. 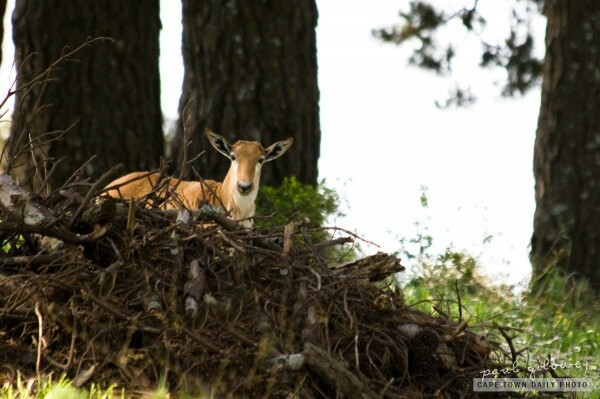 I selected a few of these to place into an album for you to view, so click here if you'd like to get a glimpse of what we saw in Kruger Park. Posted in Activities and tagged animal on Tuesday, 1 June, 2010 by Paul. I was lucky to get this photo of the Tshukudu game reserve's pet cheetah bearing its teeth. After taking the picture I looked at it and thought that it looked threatening, whereas Kerry-Anne thought that it looked more like it was smiling. The truth is that the friendly animal had just woken from its sleep and was closing its mouth after the biggest yawn ever! Of all the large cats, the cheetah is the only one that can be tamed. You could try keeping a lion or a leopard as a pet, but eventually instinct takes over and you may just find yourself becoming the prey. 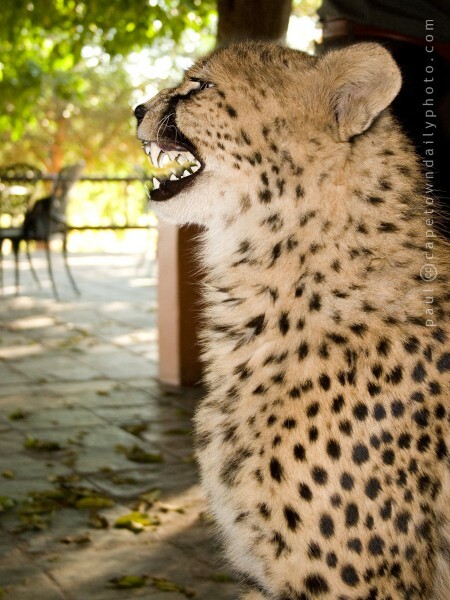 Cheetahs on the other hand are fairly domesticable. 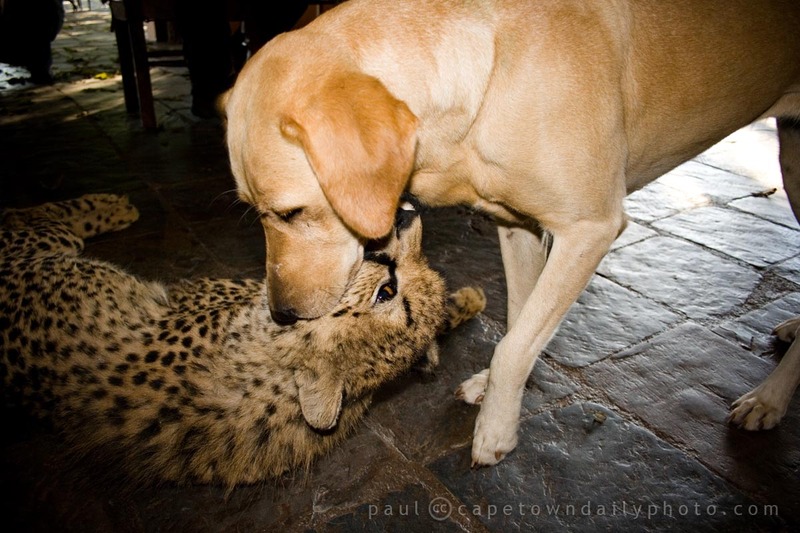 One interesting, lesser-known fact is that the cheetah is the only large cat that can purr like your own kitty! After watching the cheetah and the lodge's dog play-fight for a while, we headed out into the reserve on the back of a game drive vehicle. The first few photos of this album were taken at our own lodge, with the rest being from Tshukudu. 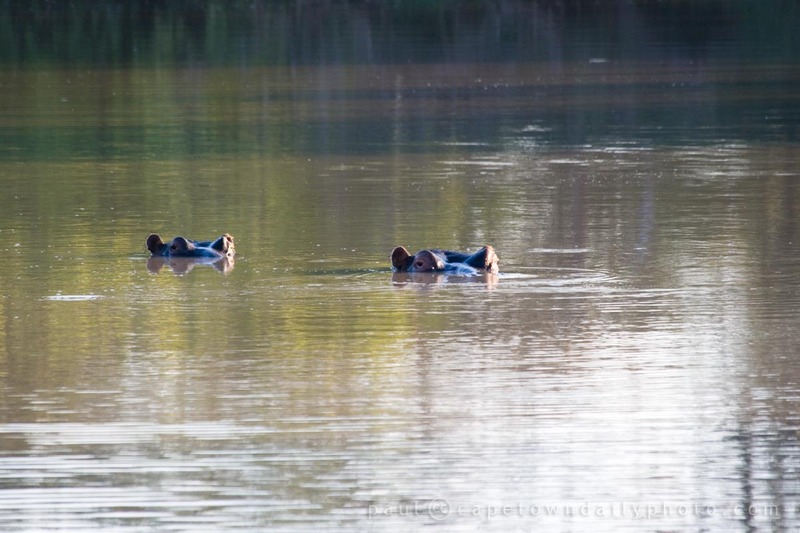 Be sure to look at the second page of the album - you'll see two hippos playing Marco Polo, and two lions and their cub that we came across after the sun had already set! Posted in General and tagged animal on Monday, 31 May, 2010 by Paul. 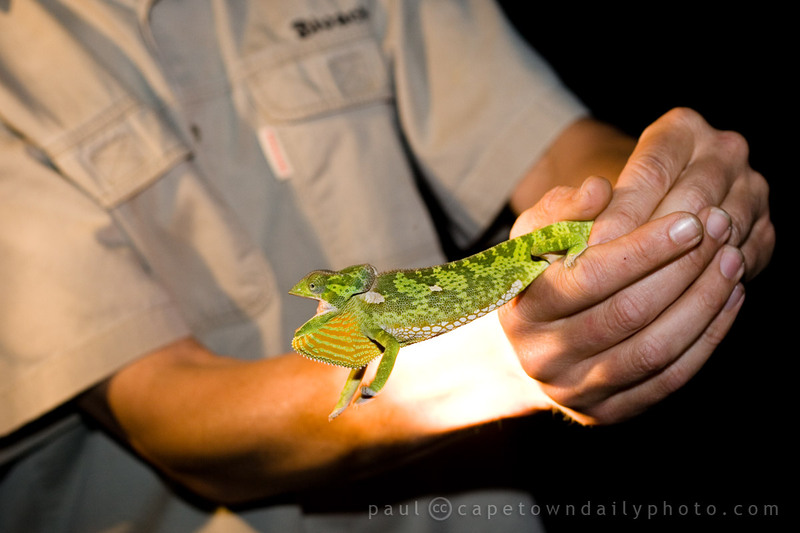 I couldn't believe how Mark, the guide on our night-time game drive, was able to spot insects and little reptiles (like this chameleon) hiding in bushes. With one hand he drove our open-top Landcruiser 4x4 along the park's dirt roads and with the other he panned a flashlight across the bush, spotting impala, zebra, owls and a multitude of other larger and smaller animals and insects. It quickly became obvious to me why it's an absolute bonus to have a guide take you on these drives! If you're confused as to how Kruger Park fits in with Cape Town Daily Photo I'm guessing that you missed my previous article . :). Posted in General and tagged animal, holiday on Saturday, 29 May, 2010 by Paul. It's 12h48 in the morning and I've been awake for far too long! You may have gathered from one of my previous posts that we'll be heading up to Tremisana Lodge just outside of the Kruger National Park for a 4-day get-away this weekend. In fact, our flight to Johannesburg leaves in about 5 and a half hours! I guess this may explain why I've posted a photo of a cat today. 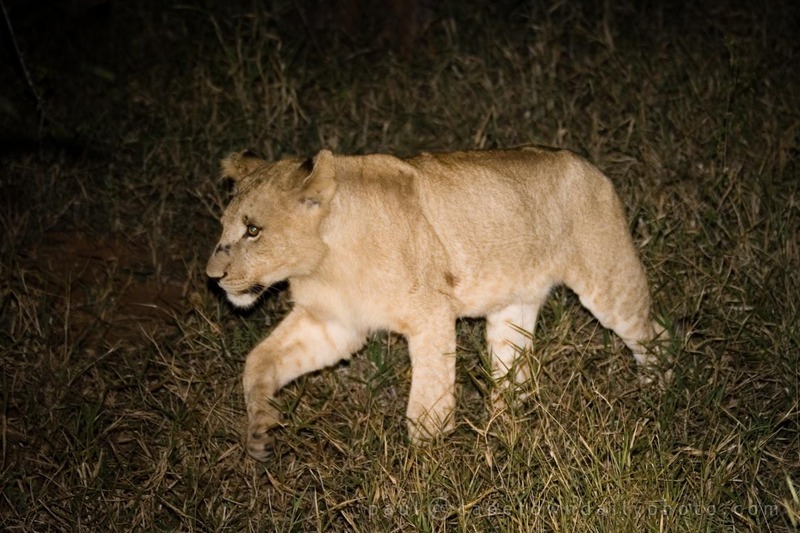 :) While we've often seen big cats in captivity I've never had the privilege of seeing them roaming through the African bush, or lazing about on the plains. It's going to be awesome! We have a jam-packed four days ahead of us, filled with game drives and walks in the bush, along with traditional African food and just enough time to laze about (like said lions) as not to be completely worn out when we return home on Sunday. Posted in Activities and tagged animal, holiday, vacation on Thursday, 27 May, 2010 by Paul. Besides for the title of this post being a little play on words (based on the title of a well-known South African comedy), it's also true. 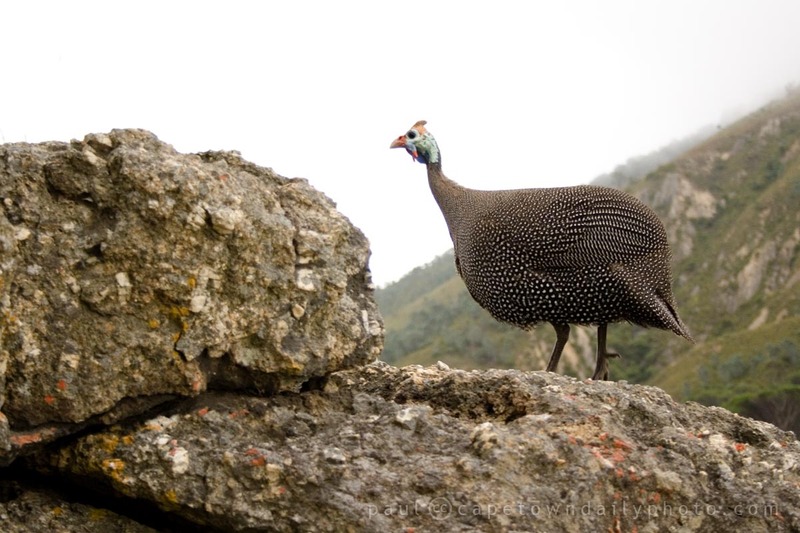 There really are Guinea Fowl roaming in our suburban gardens every day. The most entertaining spectacle is watching William (our silly, fluffy, cat) try and catch the whole flock of fowl. He (William) really doesn't stand a snowball's chance... poor thing. Posted in General and tagged animal on Tuesday, 20 April, 2010 by Paul. 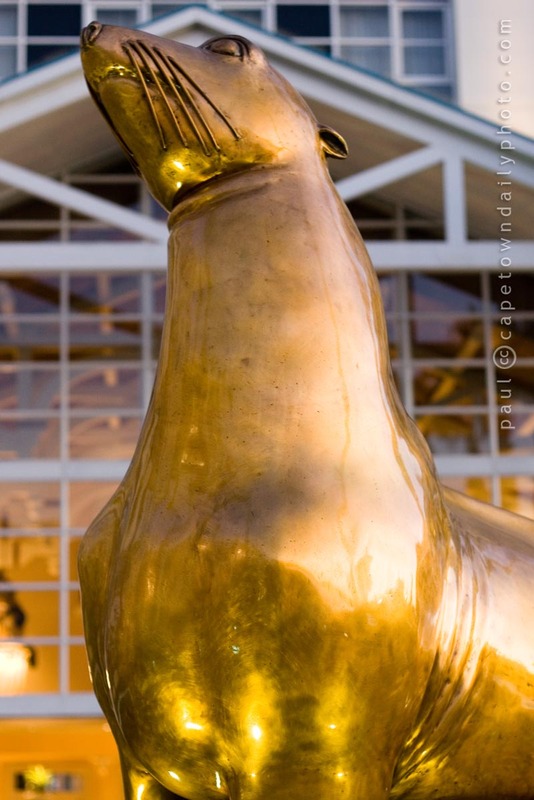 This golden statue of a South African Fur Seal (aka Cape Fur Seal) is found outside of the V&A Waterfront's Table Bay Hotel (map). In fact, the windows in the background are those that you're able to gaze out of while dining at the hotel. The golden statue was erected in honour of an old fisherman, Oscar, who often spent time fishing off a nearby pier. Oscar, reportedly, made friends with a seal who use to visit him each morning. The fisherman occasionally use to feed the seal some of his bait, or sometimes even fish that he'd caught. 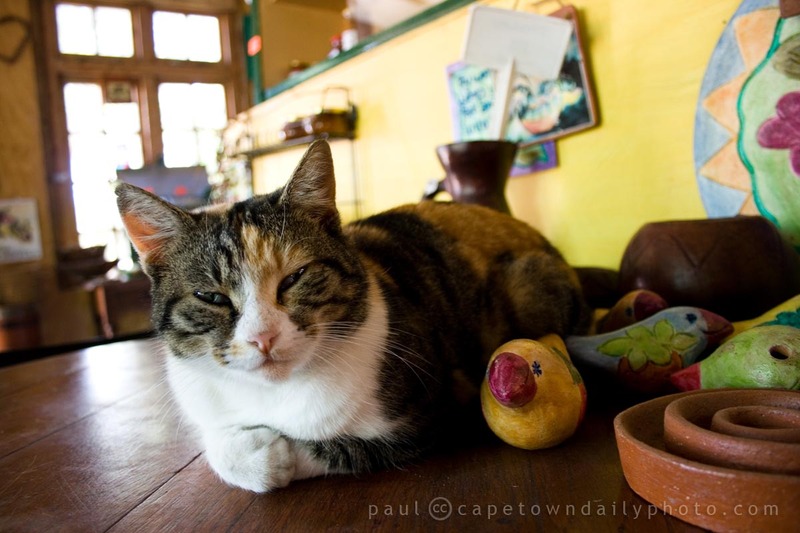 The story on the Table Bay's site is a typical ad copy, so be sure to conjure up a warmed heart when reading about the seal from the hotel's perspective. ;) You'll find their page here. Posted in General and tagged animal, hotel, statue on Wednesday, 7 April, 2010 by Paul. 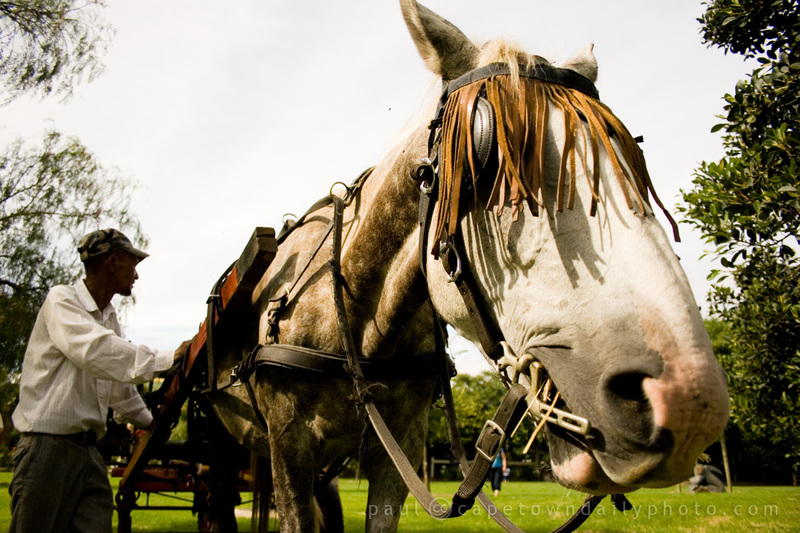 If you're looking for a place to enjoy breakfast or lunch while your kids play on a large open lawn and go on horse-and-cart rides right in front of you, think of visiting the Joostenberg Deli and Bistro on the Klein Joostenberg farm. 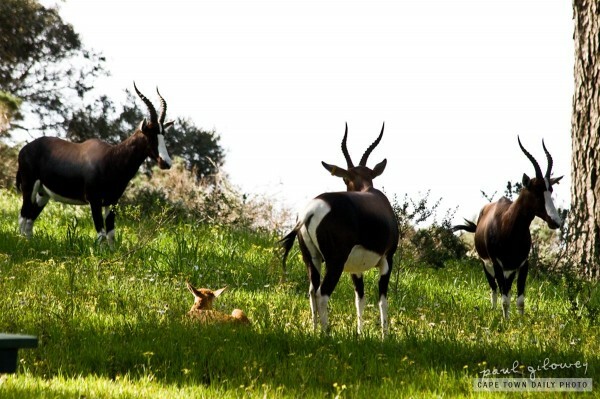 The farm is on the R302, the long road that leads from the N1 national highway to Stellenbosch, so it's pretty convenient if you're planning a day trip to Stellenbosch. Kerry-Anne and I had an early breakfast under the trees at the bistro. The food was tasty (albeit a little rich for our delicate digestive systems), and the service was great (although, I guess having a friend wait on us has its advantages ;) ). Posted in Activities and tagged animal, restaurant on Sunday, 14 March, 2010 by Paul. We visited friends of ours at their home in Constantia for a sunny afternoon outside by the pool. Before you think that this is the pool to which I'm referring - well, no, the pool in the photo is a little garden rock pool filled with frogs, tadpoles, fish and a plethora of other aquatic critters. 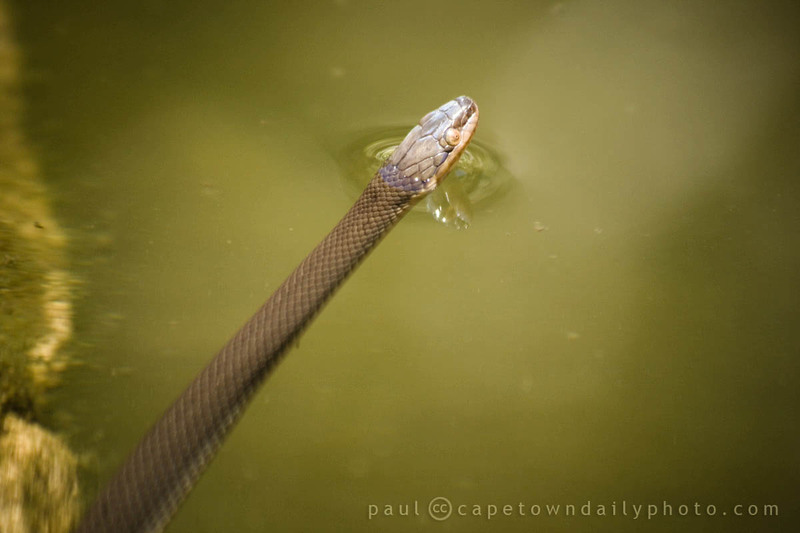 From what I can tell, the little fiend that you see in the rock pool is a very young Lycodonomorphus rufulus, also known as the South African Brown Water Snake. We stood and watched the snake come up every five minutes for a breath of air and then descend below the water, behind a couple of rocks. Posted in General and tagged animal, water on Tuesday, 19 January, 2010 by Paul. Today is the City Daily Photo Theme Day, an event held on the first day of each month to encourage you to visit some of our sister City Daily Photo blogs. We haven't taken part in Theme Day for several months now, but as I type it's 01h05 in Cape Town and can you believe it, we've actually managed to get an appropriate photo to suit the theme day topic and we've managed to post it on time! We so rock this month! Browse through the thumbnails of other participating City Daily Photo blogs - there's a whole world of contrasting cities out there for you to explore! P.S. 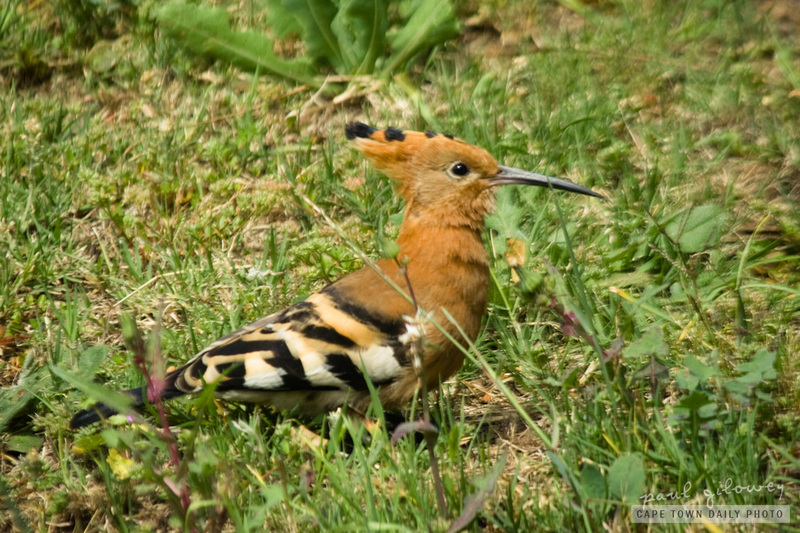 Africa's known for its wildlife. 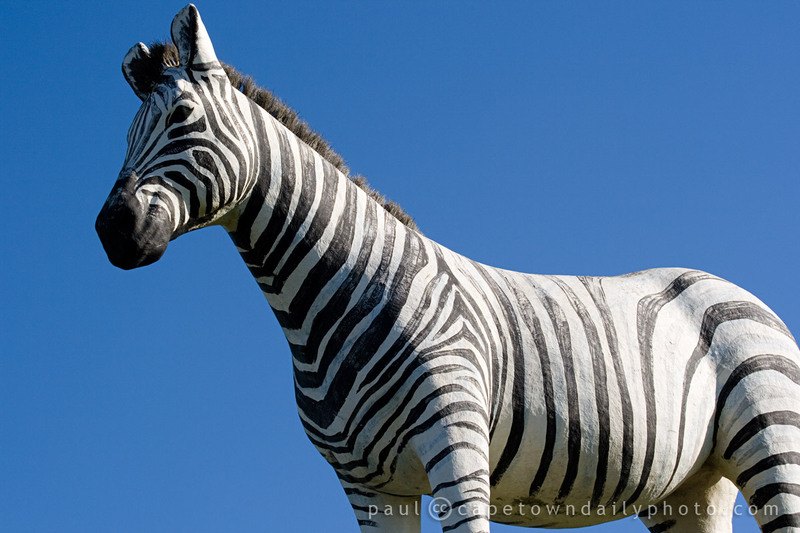 Don't you think Mr Zebra's contrasting colour scheme is perfectly suited to today's theme? 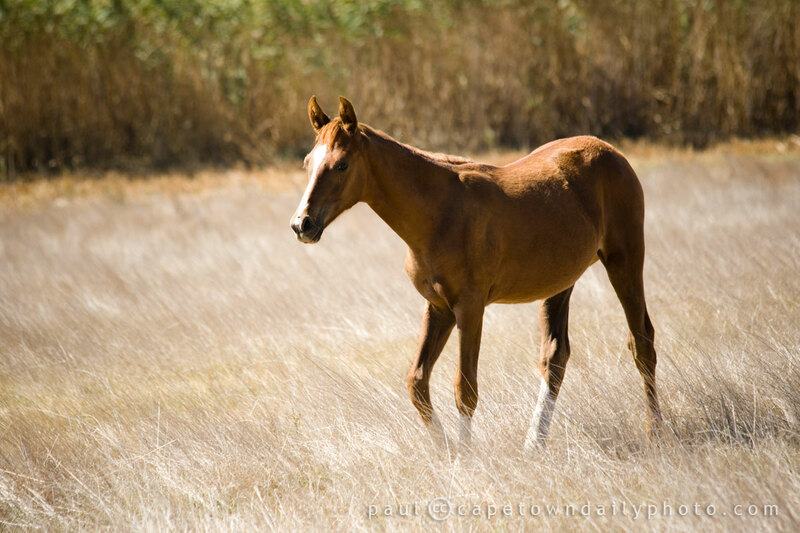 Posted in General and tagged animal, theme day on Thursday, 1 October, 2009 by Paul. I like cows, though, it seems perhaps they're not as fond of me. Or, perhaps the weapon that I was pointing at them (aka camera) was too terrifying for them to bear. 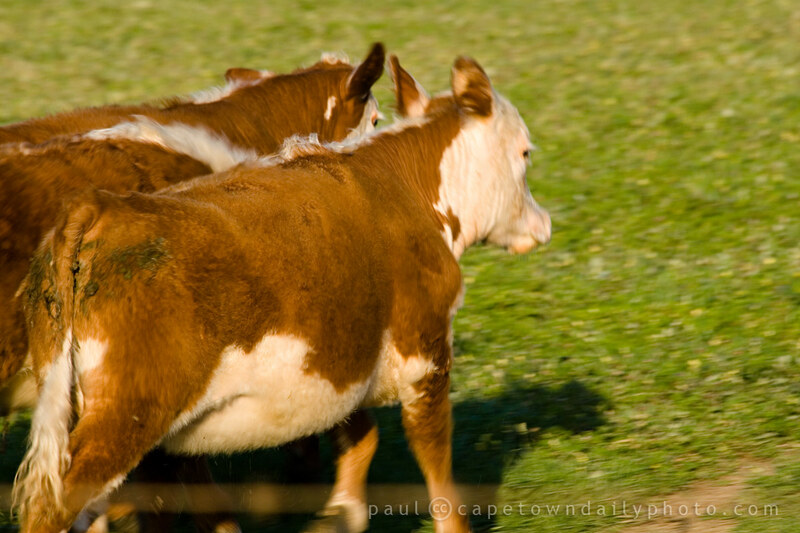 The moment I stood near the lead scaredy cow bolted, taking the others with her. Today we buy our milk from Woolworths, Kwikspar or Pick 'n Pay. In years gone by my mom gathered us three kids up for a weekly trip to the milk farm up the road - to buy fresh milk in 5-litre buckets. The best thing about buying the milk from the farm was that the cream would rise to the top of the milk (remember those days?) and us kids were allowed to scoop it off to pour over our cereal! Is there anybody out there who still gets their milk directly from a farm? 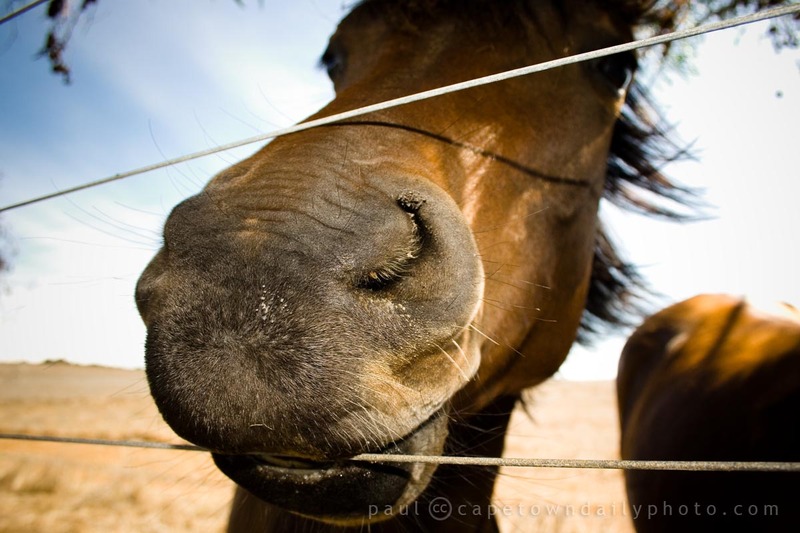 Posted in General and tagged animal on Monday, 21 September, 2009 by Paul.